Public Foundation “Foundation of the First President of the Republic of Kazakhstan” is a nonprofit organization formed in December 2000. 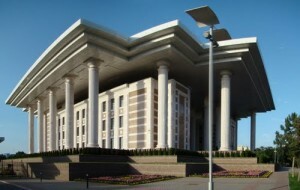 The foundation is located on the Republic Square next to the Monument of Independence, The Presidential Residence, The Akimat House, and The Central State Museum of the Republic of Kazakhstan. The primary purpose of the Foundation activities is to contribute to the strengthening of Kazakhstan’s statehood, patriotism, and further democratization of Kazakhstan society, the development of international relations of the Republic of Kazakhstan in the cultural, economic and political fields. The mission of the Foundation consists in organizing and carrying out the activities focused on scientific conceptualization, analysis and popularization of multifaceted and varied activities of the First President of the Republic of Kazakhstan, declaring his identity as the founder of the modern Kazakhstan state, national leader, main integrator of the post-Soviet territory and world scale politician.